Tone, sometimes called “Value” refers to where any particular hue or surface falls on the white to black scale – how much light is reflected or absorbed by the surface. It has to do with light and shadow, contrast and the effects of texture. A tint is a hue with white added which creates a lighter tone or higher value. A shade is a hue with black added which creates a darker tone or lower value. A neutral is a hue with grey added – which also have tonal values. If you consider how any color would look if it were filmed in black and white – an effect you can easily create today thanks to photo editing software – you can get an understanding of the tonal value of the hue. In the olden days costume and set designers in the movie studios had charts that translated colors of paint and fabric into the grayscale so that the set and costume colors could be chosen accordingly – varying by which color process the studio would employ. Red often reads very dark – hence the black lipped appearance of all those wonderful classic film actresses. A tonal scheme with a great deal of value difference from the darkest to the lightest (regardless of color) is called a “Major” scheme. One with little difference is called a “Minor” scheme. Where the majority of the values are light that is a “High” scheme, while where the majority of the values are dark, that is a “Low” scheme. There is also the idea of medium or middle. A Low Minor scheme would tend to be heavy and somber. It is rare that there would not be even one lighter hue or tint to relieve it – especially in nature. Adding a light color to make it a Low Major scheme adds some energy, and can suggest formality. (Think dark business suits with a dark tie and a white shirt.) Film Noir is Low Major. 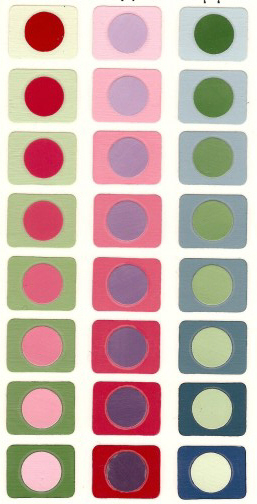 However a Medium Minor scheme could still be a riot of colors. In a minor scheme all the colors would be close to equal in value. Bright Christmas red and green is an example. However if you add white, gold or silver the scheme becomes a Medium Major scheme. Thanks to the wonderful conceit of creating both a black and white and a colorful world, the 1939 classic gives us an opportunity to see some great tonal work. In Kansas it’s not just the absence of color that suggests Dorothy’s bland life. The tonal scheme, as she wanders around the farm exteriors is a bland high minor. It’s actually a tough sell overcoming that in a single quiet song, but luckily Judy Garland was, well Judy Garland. Reportedly the studio execs almost cut “Over the Rainbow” as a slow point! However when the old biddy, Miss Gulch, appears she is notable for her dark dress. The visit to Professor Marvel’s travelling caravan and the following approaching storm take the whole scheme to Low Major, providing more chiaroscuro, and therefore energy. The Minor tonal schemes of the backgrounds are especially noticeable in black and white stills. The Emerald City (Medium Minor), the Dark Forest (Dark Minor) and the Witch’s Castle (Dark Minor) function as a background to the actors’faces and moments of action (eg flickering flames). This is a very useful concept. I’ve read some different definitions, but the one I learnt originally makes the most sense to me. Saturated hues have an inherent tonal value. I already mentioned that Red is dark (Low). A discord occurs when a color (tint or shade) is combined with a tint, so that the expected values seem reversed. It’s all about the relationships of colors to each other. a very pale Pink with Pumpkin (dark orange) is a discord. Lavender and Kelly Green is a discord. Any time you put a pastel with a bright yellow, that’s a discord. The word “tone” is used differently in writing than as the design principle. is the simplest and clearest definition of tone in writing that I have found. However in considering the design principle of Tonal Value when crafting a story it might apply to sentence length, balance of phrases, use of short or polysyllabic words, and paragraph structure. A piece with long, flowing sentences suddenly punctuated with short exclamation might be commensurate with a Major scheme. Tonal Value might also be reflected in writing by the use of descriptive words that refer to metaphorical light and shade. Tonal variations can flow softly, like an ombré or gradation, or they can have sharp edges like the glare of a sunny afternoon. Hard edges can suggest energy, strength or tension and conflict. Consider a classic chessboard – there can be no greater tonal range, in perfect balance, the setting for a perfect codified conflict. Here’s another wonderful site about color theory.